Lutfor Rahman lived in Kalihati Upazila of Tangail. His father was died keeping 5 children. Lutfor Rahman was the youngest child of his family. His family was not well off because only earning member, his elder brother also died when he took the responsibility of his family. By this time he married and become father of two children. It was difficult for him to run the family smoothly. He inspired by a successful migrant of his village and thought to migrate for economic development as like as him. He took loan from neighbors and relatives with high interest and migrated to Iraq in 2012 spending tk 4 lac 50 thousands. Within a short time he repaid the loan, built a house and saved money for family working in Pepsi Company there. He has been staying there for 5 years but in 2017 he was affected by Jandice and Diabetics. He applied for leave from company but company delayed 5 months to grant his leave. After 5 months company helped to reach at airport to sent him back to Bangladesh observing his severe illness. On the day of returning, he became sick at the airport. The authority canceled his flight and admitted to Bagdad City Hospital observing his serious condition. After admitting he was died there undergoing treatment on 11 February 2018. 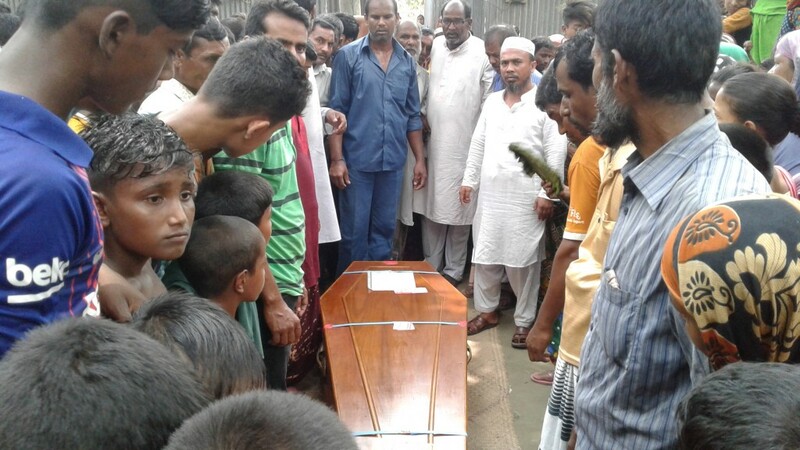 Bangladesh Embassy communicated with the family of Lutfor Rahman and provided the information of his death. This news was beyond their imagination that shocked them immensely. His family broke down with fears how the dead body would be brought back home. RMMRU had been with his family since the beginning. They supported them closely to submit application to DEMO office as well as Wage Earners’ Welfare Board to return his dead body from Iraq. They move towards step by step formally and communicated with DEMO, WEWF, and Bangladesh mbassy regularly. After waiting one month RMMRU was informed formally that government have not sufficient budget in Iraq to return his dead body. And they suggested either provide 6 lac taka to return or give permission to burry there. This news makes them extremely disheartened. His family couldn’t find any light of hope anywhere. They could not believe they won’t see the face of their desired person who was supposed to return home in good health. But RMMRU didn’t give up the hope and tried its best to stand beside this deprived family. As next step it submitted application to Minister, Secretary of MoEWOE, WEWB and Embassy of Iraq and communicated with high officials accordingly so that his dead body can be returned to Bangladesh. Though this process government took this case seriously and undertook initiative to return this dead body managing shortage amount of money. Finally after 4 months his dead body was sent to Bangladesh on 14 June 2018. A huge number of people of that area came to see the dead body for once. They praise the activities of RMMRU and stated that “Not only this village, people of this area will remember RMMRU with gratitude”. His family said that “we will keep in mind the help of them in our whole life”. We never thought this body would be brought to the country. Without RMMRU’s intervention neither we bring this dead body ever in Bangladesh nor it took long time to return. We salute RMMRU to stand beside us since the beginning cordially”.